CM and SP are more and more close each to the other since they share, in some sense, the same objective. They are both concerned with building, rebuilding and protecting consistency among sets of constrained objects. A first difference may be that CM is (was) rather concerned with a limited set of object types, those who are well provided with tools when the scope of PM is more large, want to cover all the software life cycle and includes object type whose existence is more dependent on human creativity. 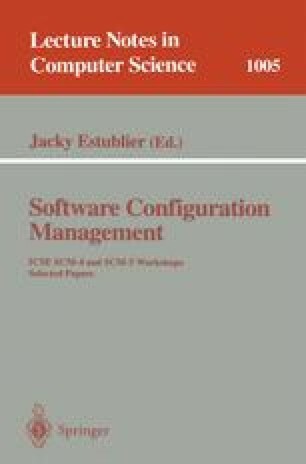 However, at this time new types of objects are considered in configuration management (including documents of all phases of the software life cycle and some aspects of resource management) and the application field of configuration management becomes more and more large. As a consequence, technics for configuration management become more and more complex: workspaces, transactions, general constraints,... [3, 1, 6], close to the technics used to develop Process Centered environments. In some way, PM seems to be a natural descendant of CM. A second important point is about cooperation. Our experience in the Coo project clearly indicates that supporting cooperation in a consistent way has a great influence on the underlying environment architecture. Particularly, we think new mechanisms dedicated to cooperation support are necessary, in addition to the classical ones found in traditional database systems and software engineering environment and probably that traditional CM technics are of the highest interest to support this aspect.